Finally, there’s a place where you can create your predictive models in a simple way and share them with the rest of the world! And (if you want to) monetize your data wrangling and predictive modeling skills in Spring TX. 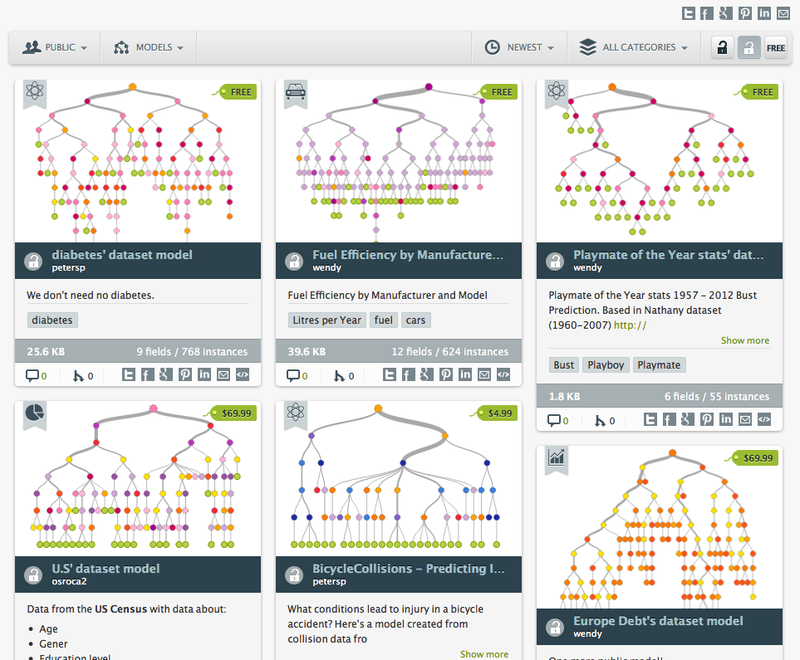 As a BigML user you can already create great predictive models in a simple way. It is literally a few clicks after uploading your data. Now, once you have created a great model, you can share it with the rest of the world. For free or at any price you set. Or you can keep your model to yourself but allow others to make predictions with it. You can browse the models that have been published by others, make some predictions and clone the models that you like. It is all – in grand BigML tradition – extremely easy to do. How about your data? Can you sell that in the Gallery too? Yes, you can! You can make your Dataset public. 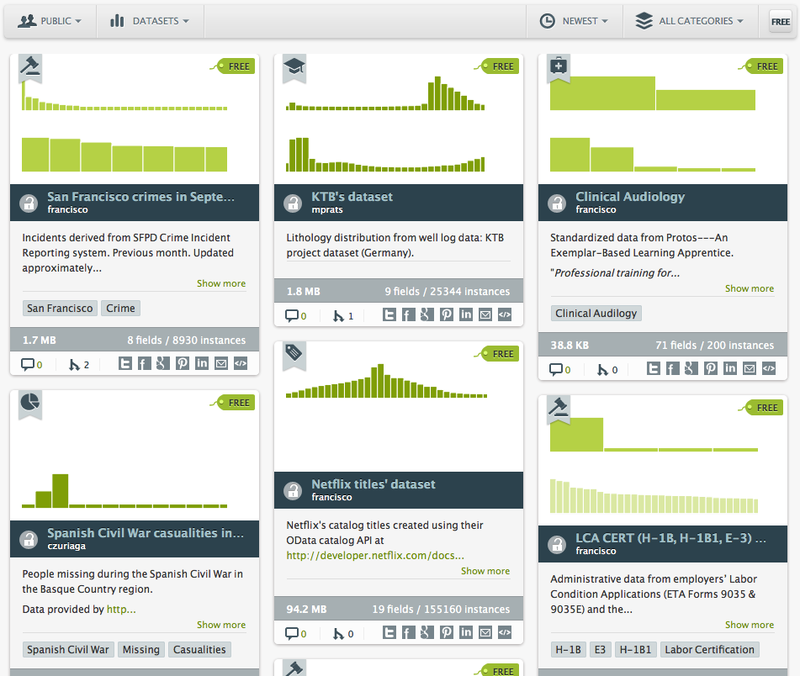 Mind you: the Datasets we are talking about are BigML’s fancy histograms. This means that other BigML users can look at your Dataset details and create new models based on this Dataset. But they can not see individual records or columns or use it beyond the statistical summaries of the Dataset. Your Source will remain private, so there is no possibility of anyone accessing the raw data. As you set the price for models and predictions, it is immediately clear how much revenue is coming your way with every sale. As you move the slider to set your price or type it in the price tag, the right side of the panel indicates your earnings (see ‘setting the price’ below). You receive 70% of the sales of your resources. This will be paid out on a monthly basis, with a required minimum balance of $100.00. So how does it work? How do you make your predictive models public? Every model is private by default. While viewing your model, just click on the ‘More info’ icon and a panel will open with, well, more info. Here you can change the name of your model, add an enticing description, select the category you want your model to be published in and change the privacy settings to make it public. Clicking on the white open lock will open up your model to the rest of the world. Anyone can now buy your model, explore it, use it to make predictions as if it was their own model (with the one exception that they can not put a purchased model up for sale again in the Gallery). We call it a White Box Model. Users can also use your White Box Model to make predictions. 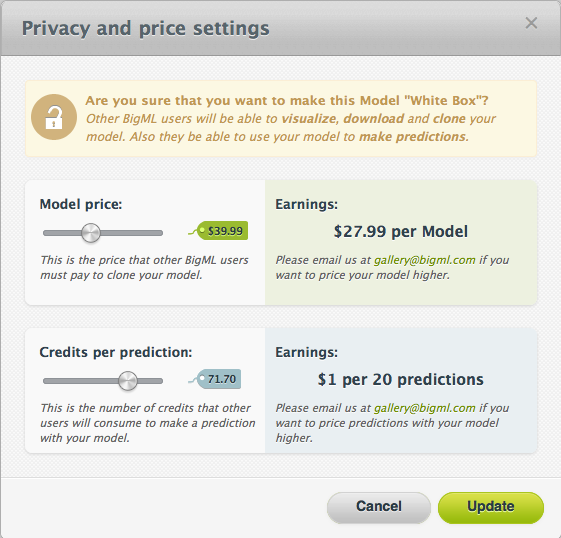 After selecting your model’s new privacy setting, you need to set the price for model and predictions. White Box Models can be free: you just want to share this great model and have no interest in making any money off of it. You can also set a price for your White Box Model with a minimum of $1.99 and a maximum of $99.99. But suppose you have a model that predicts next week’s winning lottery numbers? That’s probably worth more than $100, wouldn’t you say? Just contact us and you can set the sale price as high as you want. 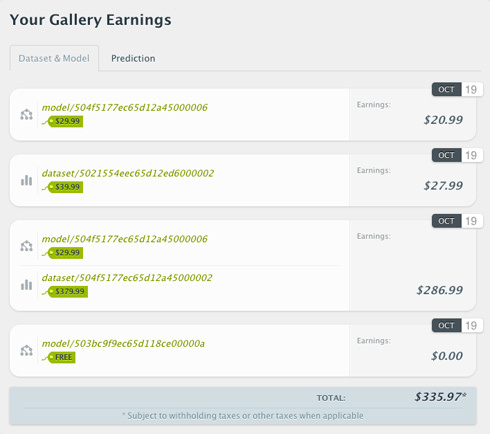 For models priced $100 and over we will review your model and the Dataset to make sure that the description matches the model and that the model is solid before publishing it with your requested price in the Gallery. You also need to set a price for predictions. Predictions are paid for in BigML Prediction Credits (Remember? 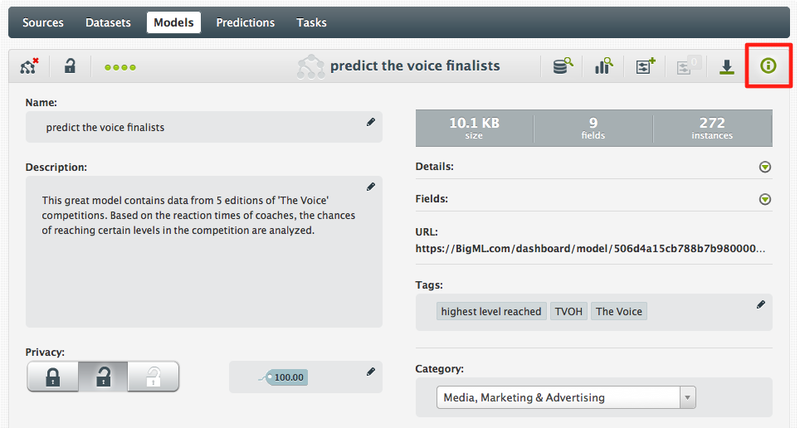 BigML uses Data Credits for creating and storing datasets, Model Credits for creating models and Prediction Credits for running predictions.) The minimum price is ‘Free’ and the maximum price indicated is 100 credits. Again, you can request a higher price and put up the model for review by BigML. There’s much more to tell, but you’d better go out and explore BigML’s Gallery. Better yet, create some models and publish them! Don’t forget to be social about it. You don’t need to get seo services to let the world know what you think of a model and any other user’s gallery by clicking the icon of your favorite social media. BigML’s Gallery is publicly accessible. You don’t need to register to take a look!